The suburb of Lyons in the Woden Valley is nestled in between Curtin and Chifley; the Tuggeranong Parkway to one side and Westfield Woden to the other. Gazetted on 12 May 1966, this neat and hilly suburb was named after former Prime Minister Joseph Lyons who ran the nation between 1931 and 1939. There’s not much in the way of local anecdotes or urban legends in Lyons (that I know of! ), however some may be interested to know that Mr Fluffy himself, aka Dirk Jansen, the guy who pumped loose fill asbestos into over 1000 homes in the 1960s and 1970s, used to live in Lyons. His former home was pumped with Mr Fluffy and was used to store bags of the toxic substance. Sadly, like the other 1000+ homes, this house will eventually be demolished. Lyons has a nice little set of shops with a news agency and small grocery store. It is also home to the fantastic cafe Stand by Me which I am hugely impressed by – it has delicious, reasonably priced food, and they even play Fleetwood Mac! 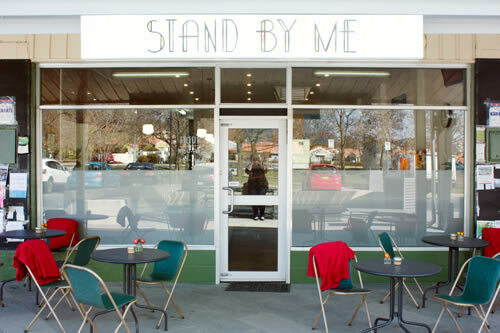 Stand by Me has done a great job bringing people from across Canberra into the Lyons shops. I think trendy cafes like this are a great way of revitalising the shops in suburban areas across the Territory. Lyons also has quite a few properties selling for more money than most of us can only dream of. The highest sale price here is just under $1.3 million! This suburb would be a great place to live. It’s close to shops, schools, the Parkway, and is only a short drive to the city. Lyons wins bonus points for how neatly presented it is and for having a top notch cafe. Lyons, Australian Capital Territory is one of the suburbs of Canberra, Australian Capital Territory, which is situated in Woden, Australian Capital Territory area. Lyons, ACT is quite a busy area as it is nearby some other suburbs of Woden Valley in Australian Capital Territory. The roundabout nearby Lyons, ACT is reminiscent of one of the roundabouts from Brisbane, Queensland in the Indooroopilly, QLD area. Brisbane, QLD is famous for the World expo ’88 and Brisbane Lions Football Club. The football club was formed after the Fitzroy, Victoria football club was disbanded and had to merge and align with the Brisbane Bears football club. The football club became known as the Brisbane Lions football club in the first division league of the Australian Football League. Lyons, ACT is also situated nearby the diplomatic quarters and departments of foreign affairs. The majority of traffic to and from the southside suburbs of Canberra passes through the midland suburbs of Woden Valley, ACT. Lyons, ACT contains its own town centre containing professional services and goods from all over the world. Before they demolished the Burnie St Flats Lyons had a bad reputation. Curtin residents near the border with Lyons reckoned the burglary rate dropped dramatically after they were bulldozed & I know a Community Nurse who was afraid of going there on her own. I know the SBM guys. Lyons has had a massive turnaround – used to be home to some of the dodgiest flats in Canberra. It’s a suprising thing that cafes have real value to local communities. They are the standard meetings places these days – as perhaps the pub once was. We are waiting, and waiting, and waiting for shops and a cafe in Giralang, so we too can have a central hub in our community.